MUFF WIGGLER :: View topic - Anyone excited about FSFX Low Pass Gate - coming soon? Anyone excited about FSFX Low Pass Gate - coming soon? So as of a couple months ago, I didn't even know what a Low Pass Gate was. After hearing it in action on a couple youtube videos, now I've just GOT to have one. It's simply got THAT sound that recognized immediately, and now I've got to have it. I've got 4 filters now, but none sounds like an LPG. I nearly purchase one.... and then I found out that FSFX is developing an Uber-LPG.......... any recommendations out there for an MU LPG? Most likely i'll just wait for the FSFX one, but looking for more LPG info anyway. Couple of months back, I asked FSFX if he could build a DJ Thomas White LPG for me (he's been making them with his own 1MU panel). He could, but he also told me he's working on a design of his own. ... any recommendations out there for an MU LPG?. Maybe the DJ Thomas White LPG, then? Because I just bought the DJTW Triple Lopass Gate from Synthcube about 2 weeks ago. Then FSFX announces theirs is coming, for less money. Theirs is a quad with no mixer, the Synthcube is a triple with a mixer. I will relocate my triple to my portable skiff, and get the free state for my studio cabinet. Vactrol filters vary all over the place and even within some multi-units... it's a pretty good chance the FSFX will sound different than the DJTW, etc. (one reason I've still never got one)... almost went for Wiard in frac years back, but couldn't decide between the boogie and borg (I know those aren't straight up Buchla low pass gates, but the notion translates). Still interested, though (on the other hand, that's about the only call of a euro system for me: Sputnik... seems way less expensive than they were in MU, at least based on the used prices). I have a FSFX DJTW and a MegaOhm CdS VCF/A and if I had to pick, the MegaOhm CdS wins, hands down. A wider range of sounds, better range, and some nifty extra features. Phil mentioned last year he was working on an updated version that won't be as deep so I'd check in with him. his new low pass gate is not even out of the pcb completion phase yet..
"Getting ready to prep the art for PCB etching." 16th july. reality has set in... so i am now! Just finished the first batch yesterday. Couldn't be more excited to see/hear them in your racks. Thanks to months of design and some much needed help from our friends we finally got everything right and sounding incredible. Our Lopass Gates are a custom design, but obviously primarily based on the original Buchla schematic. 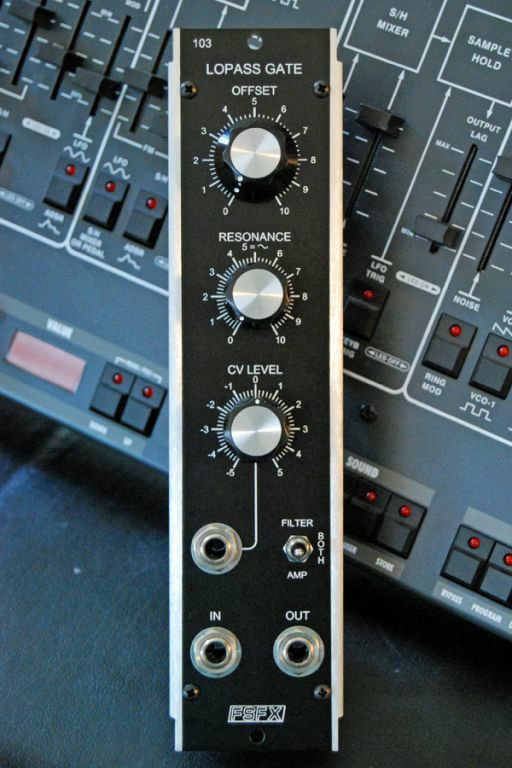 Phil from Megaohm was kind enough to let us use his Resonance modification, then we added some asymmetrical clipping diodes (got the idea from Stites Mutant Vactrol Filter, although he uses a different implementation) to keep the signal levels in check and generally smooth things out. We use an attenuverter for CV control. No audio input level control and as we found input levels do not change the character of the filter/amp. Audio and video demos in the next few days. There are five different clips demonstrating the different modes of operation. Modules are currently available at the freestatefx website. Price is $220 plus shipping. Limited stock. Working on the video demo next. Stay tuned. I'm going to end up paying for an addition to Jason's house if I keep buying all these FSFX modules. I'm really trying to be disciplined here. David don't give my wife any ideas. Here is the video demo I promised. Pleased with the audio. Going to have to work on cool logo fade-ins and what not, but at least this is a start. So good. I can't do it right now, but I hope to order one before the end of the calendar year. Well.... it looks like FSFX gave up on the uber-2U version of an LPG, and made an affordable 1U version instead. I was already mentally anticipating getting one, so I just ordered it from Noisebug. Nik there says it's nicely aggressive sounding..... I've never played with an LPG before, so I'll have some fun with it this weekend. Got mine super fast shipping and service. Very well made. Sounds awesome. Thanks Fsfx. EDIT - It showed up today (Friday)! Time for some wiggling! Got to spend a couple hours with mine last weekend, and happily discovering that it sounds nothing like the 4 other filters in my rack. Being a newbie to using an LPG, I'm loving the weird resonant behavior.... Really wishing that resonance was VC'able though. This may be my Go-to filter for basses now!... until the next shiny knob that comes along. I've waited this long, but should have a secondhand one on the way... pretty excited, especially since this will be my first LPG! I kind of promised myself that I'd stay away from Buchla-type modules in 5U (Serge, EMS, etc., too), and if I went that way, it would probably be in the original formats or Euro... well, that dam cracked with a lovely Krisp1/Oakley versatile ramp generator (Sergey, right?) in MU last year and now this. So far, I'm keeping the Euro and standalone stuff at bay (other than a Roland A-01K for $150) and sticking to used 5U, vintage and a few Wiard and Blacet frac modules. Back to this module... in stock at noisebug, but not FSFX last I looked. I'll report back after testing. Interestingly, mine turns out to be not one of the new ones, but using a single djthomaswhite LPG card... I guess this is what FSFX did before the new one. It's OK, I've thought about getting a multiple DJTW on and off for along time... not installed/tested here yet, but I think I'm gonna dig it! I wonder how this compares to the Megaohm Cds VCF/A. Especially, how much bleed there is in the Both mode. Compared to Megaohm in its "LP1" mode? I have both the MegOhm CdS and FSFX LPG. The FSFX one sounds great. The resonance gets plenty harsh but but stays very musical and dials in evenly. There's a little bit of Bleed, but only at certain settings and it's never enough to bother me. I don't even notice it unless I'm trying to listen for it. I just picked up a RYO Aperture. If you're handy enough to port one over from euro, it would be another great option. I just noticed this from the Megaohm Cds manual: "PCB bracket extends 5” behind panel". Ouch! I guess I will get the FSFX then. DIY is not for me, but what I really "need" is the Rabid Elephant Natural Gate converted to MU.